We arrive to talk to Lubna Khan in her office at Berrymede Primary School, situated in the heart of the South Acton estate, on a Monday morning shortly after assembly. She is already hopping mad. The large number of certificates proudly displayed in her office include one from the Evening Standard for ‘outstanding achievement in difficult circumstances’. We have been asked to come and meet with Mrs Khan as she is increasingly frustrated by her dealings with Ealing Council’s Parks Department. For years, the Headteacher of Berrymede Primary School has been trying to improve the lives of the pupils in her charge and of the wider South Acton community by taking steps to look after Berrymede Recreation Ground. 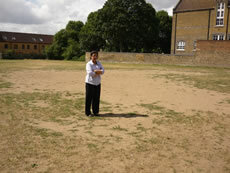 The message from Ms Khan is simple: “Give this patch of land to the school and we will take care of it. We will work with the local community to ensure that it is kept litter free, the grass is maintained and that it is a useful facility for the school and for the residents of South Acton." Unfortunately, despite the interventions of well-meaning councillors and politicians, the scrubby piece of land, which lies at the heart of the South Acton Estate, remains a pitiful sight. “Since I started working at Berrymede, which is six years ago now, I have been campaigning for this patch of land to be maintained so that it is usuable by the pupils of Berrymede Primary and by the local community. “Finally, after a lot of discussions and lobbying, Ealing Council’s Parks Department planted some seeds here last September and told us not to use the field for a few months. “We stayed off the field for the time stipulated and watched as pigeons ate all the seeds. No one from the Council came and watered or did anything to help the grass to take root. As a result it is no surprise that the field now looks derelict. “In fact,” remarks Mrs Khan, “at the moment, Berrymede recreation ground is little better than a dirt track and it was embarrassing that, during a recent event at which the Mayor and his Deputy were present, children had to be reminded not to run on the dusty patch because they would kick up dust which could get into people’s eyes. 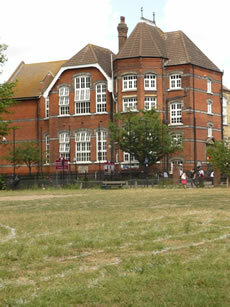 “If Ealing Council don’t want to give the patch of land to the school for whatever reason, then perhaps they could consider leasing it to us for a peppercorn rent on an annual basis. Huey Reid, Coach for Bollo United, is totally behind Mrs Khan’s campaign. “Last year, Bollo United, which keeps up to 800 local kids occupied in football training and playing matches every weekend, had to pay £600 to hire a pitch in Greenford from ECT. We would much rather be able to train and play here in Acton instead of spending time and money bussing children around the borough. 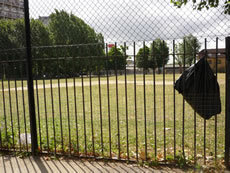 A spokesman for Ealing Council said: "Berrymede open space was never intended to be used as a sports pitch. It has been over used in the past and suffered as a result of the exceptionally dry spell we've had over the last few months. "Sports pitches need far more intensive maintenance than other green spaces, so where schools use parks for their sports activities they are required to pay to help maintain them. "We are looking forward to meeting Ms Khan next week to discuss the ideas she has for how the area can be managed in the future."